The most common soft-tissues injured are muscles, tendons and ligaments. These injuries often occur during sports and exercise activities, but sometimes simple everyday activities can cause an injury. Sprains, strains, contusions as well as tendinitis and bursitis, are common soft-tissue injuries. Even with appropriate treatment, these injuries if severe may require a prolonged amount of time to heal combined with weeks of rehabilitation. Sprains and strains are usually common minor injuries that share similar signs and symptoms, but involve different parts of your body. They often occur during sports, exercise, or other physical activity. The affected joint(s) may be unstable or you may not be able to use the affected part of your body if the injury is serious, involving a muscle or ligament tear. Exercise when bones and muscles are fatigued. Click here for video, "Neck Strains and Sprains". Sprains tend to happen with sudden, unexpected movement like a fall or a twist. When a twisting force is applied to a joint while it is bearing weight, this may cause the ligament to stretch beyond its usual limit and become injured. Or, when one overextends (severely stresses) a joint by stretching or tearing a ligament... a strong band of fibrous connective tissue that connect the end of one bone with another in your joints. Ligaments stabilize and support the body's joints. For example, ligaments in the knee connect the thighbone with the shinbone, enabling people to walk and run. The areas of your body that are most vulnerable to sprains are your ankles (most common area), knees, elbows and wrists. Sprains often occur during a loss of balance while running, jumping, or making sudden movements. Usually, a twisting movement makes the ligament stretch further than usual, causing the sprain. Being injured before or having limited flexibility may contribute to sprains. A thumb strain can occur during a skiing injury or over-extension when playing racquet sports, such as tennis. 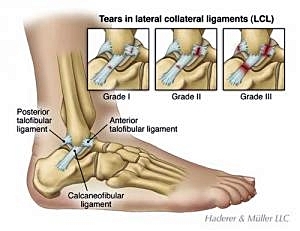 Grade 3 sprain (severe): Complete tear of the ligament. This causes significant instability and makes the joint non-functional. While the intensity varies, common symptoms of sprains may include: pain, swelling, inflammation, bruising, limited ability to move the affected joint; and at the time of injury, one may hear or feel a "pop" in the injured joint. Mild sprains and strains can be successfully treated at home. Treatment for mild sprains includes: chiropractic mobilization and adjustments; P.R.I.C.E. (see below); and sometimes physical therapy with stretching and strengthening exercises. Moderate sprains often require a period of bracing. Severe sprains and strains sometimes require surgery to repair torn ligaments, muscles or tendons. Muscle strains happen when the weight on a muscle is greater than the weakest part of the muscle can bear. Strains tend to happen during activities that require your muscles to stretch and bear weight at the same time. A strain is a stretching or tearing injury to a muscle(s) and/or tendon(s). Tendons are fibrous cords of tissue that attach muscles to bones. Strains often occur in the muscles that support the calf, thigh (typically the hamstring at the back of the thigh), groin, foot, back and shoulder. Similar to sprains, a strain may be a simple stretch in your muscle or tendon... or, it may be a partial or complete tear in the muscle-and-tendon combination. Typical symptoms of a strain include pain, swelling, inflammation, muscle spasm, muscle weakness, limited ability to move the muscle and cramping. Using athletic gear that is too loose or too tight. Soccer, football, hockey, boxing, wrestling and other contact sports put athletes at risk for strains, as do sports that feature quick starts, such as hurdling, long jump, and running races. Gymnastics, tennis, rowing, golf and other sports that require extensive gripping have a high incidence of hand sprains. Elbow strains frequently occur in racquet ball, throwing and contact sports. The recommended initial treatment for a strain is the same as for a sprain: protection, rest, ice, compression and elevation. This should be followed by simple stretching and strengthening exercises to relieve pain and restore mobility and stability. Surgery may be required for a more serious tear. There are two types of strains: acute and chronic. An acute strain occurs when a muscle becomes strained or pulled, or may even tear when it stretches unusually far or abruptly. Lifting a heavy object or lifting in an awkward position. Poor equipment. Ill-fitting or poorly maintained footwear or other sporting equipment can contribute to your risk of a sprain or strain.